You’re engaged to be married! Now you can begin planning the wedding of your dreams. Simple, right? Not so fast. Planning a wedding can be a huge undertaking. After all, you’ve got to plan your guest count, find a caterer, book a venue, buy a dress… and that’s not even the half of it. If you’re planning a wedding ceremony and reception and planning on inviting a few guests, it can be easy to feel overwhelmed at the thought of doing it all yourself. One option is to hire a wedding planner. Of course, a wedding planner may be out of your budget or unavailable for your particular date. For that reason, we’ve put together some of the best tips from professional wedding planners and resources around the internet in order to help you stay organized and plan a wedding that fits who you are as a couple. After all, the most important wedding planner is you. The tips below are gathered into some of the most important “to-dos” leading up to the day you say “I do.” Whether you just got engaged, are in the middle of planning the details, or are just days away from your nuptials, consider these pro tips for ideas and inspiration as you continue to carve out your vision of the perfect day. For couples just starting to plan their wedding, this is a great place to start. After all, wedding websites, bridal magazines, and reality television can affect our perceptions of what really matters — especially when it comes to planning such a momentous occasion. Sit down with your betrothed and write down what you most want from your day. Start with three items that are most important to you. Are you committed to a traditional tiered wedding cake? Put that on your list. Have you always envisioned a live band to get people on the dance floor? Write that down. Maybe you don’t care about wedding colors, cake, or even dancing as long as your wedding dinner is catered by your favorite barbecue restaurant. If it’s important to you, write it down. Take the time to choose those things that really matter — and also, the things you want to spend money on. Then, you can be happier knowing that the rest of the details are just details, and probably don’t merit too much worry or expense. Budgeting isn’t anyone’s favorite part of planning a wedding, but for many couples, it’s important to plan a day that doesn’t deplete the savings account. However you are financing your day, having a budget can help you allocate resources to the aspects that are most important to you. It’s certainly possible to throw a gorgeous, personal wedding without spending an arm and a leg. And when it comes to personal touches, the sky’s the limit. Indeed, part of the fun of planning a wedding is deciding on the things you can do yourselves and really make your personalities shine through. Personalized wedding favors are a great place to add a special personal touch on your wedding day. Celebrity wedding planner David Tutera describes wedding favors as “the cherry on top” of a great wedding celebration. “When your guests leave, your favor should serve as a happy reminder to them of the wonderful event they had just attended. You should think about this, too, when purchasing favors as opposed to crafting them,” he says. In fact, there are plenty of options out there for purchasing favors and customizing them to make them personal and meaningful. Thanking your guests with personalized wedding favors gives guests a great souvenir of their time with you, and a sweet “thank you” before you even send out your thank-you cards. 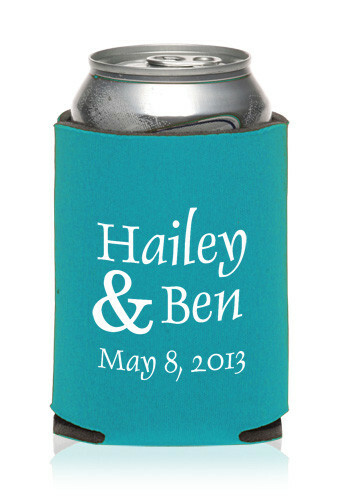 Custom koozies, also called can coolers, are a useful item on the day of your wedding as well as fun favors your guests can take home. 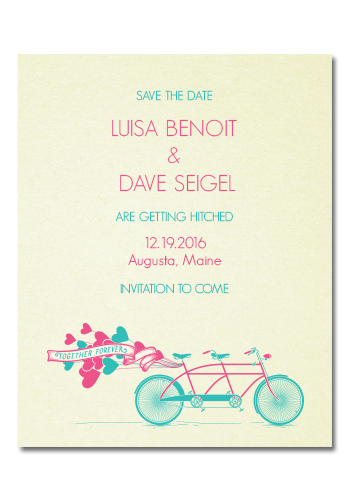 Customize them with your wedding colors, your names, and your wedding date. Personalized tote bags. 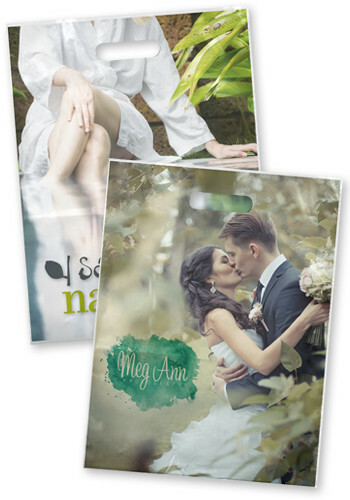 Custom tote bags make excellent wedding favors as well as welcome bags. You can fill them with candies, snacks, or ideas of fun things to do in the area, or else gift them as is, printed or embroidered with your initials and wedding date. Stemless wine glasses. 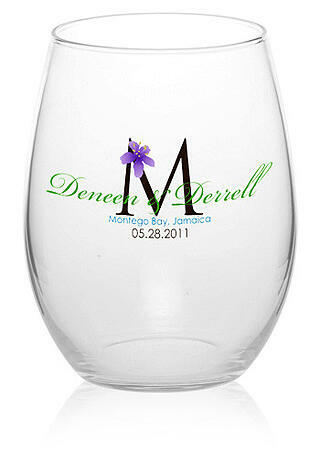 Many couples choose to serve wine at their weddings, and stemless wine glasses make lovely favors when printed with custom names, initials, or brief messages of love. For a fun DIY craft, purchase your wine glasses early and make them into candles with scented wax and hand-cut wicks. Note: this makes a great bridal party craft! Personalized sunglasses. For those planning a more casual wedding on a budget, personalized plastic two-tone sunglasses make a fun favor that really emphasizes the party atmosphere. Just choose your color and personalize the stems with your names and wedding date. Plus, if you’re looking for beach wedding ideas, sunglasses are perfect for sunny wedding ceremonies. When it comes to planning a wedding, it’s important to research as much as you can — from dress shops, to venues, to wedding vendors. While wedding planners often make suggestions based on past relationships and previous weddings, it’s still possible to do your own homework to find people and companies you love. Try this tip from TheKnot.com: “In a three-ring binder, compile all your correspondences with vendors, notes you make during meetings, and photos or tear sheets from magazines you want vendors to see. Set up a special email address dedicated to your wedding, and store important vendor numbers in your cell phone.” Tips like this can help keep you organized, even when you’re doing it all yourself. Whether you hire your own wedding planner or not, take the time to consider your own budget, style, and personality while you plan your wedding day. Consider David Tutera’s advice: “The secret to planning your big day is to bring as much personality to your event as possible.” This way, you can help make your wedding fun, relaxing, and a true reflection of your love and commitment — and hopefully have some fun while you’re at it!